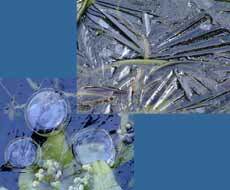 3 February - Things have remained quiet in the pond since my last diary entry. The quick cold spell last week produced some ice although it did not freeze over completely and the ice disappeared within two days. In contrast, after a very mild day the outside temperature at 9.30pm is still 12C! Frog numbers have still to reach anywhere near last year's numbers (20+) at this stage and I have just counted some 16 between the two ponds. A few of them were very actively dashing about the pond, suggesting that they were already looking for partners. These two had obviously already met up and were keeping very still. While I was counting the frogs I also spotted two Smooth Newts swimming in the big pond - Last year I spotted the first ones on the 2nd. 4 February - As the mild weather continues (it was just under 12C first thing, and at 2.30pm it is 15C) plants like the Duckweed are multiplying rapidly, so I spent some time skimming the surface of the big pond this afternoon. I rescued numerous Planorbis type molluscs from the discarded weed, but the most interesting find was this snail. One that I don't find very often, it looks very much like the illustrations I have of the Moss Bladder Snail (Aplecta Hypnorum), although I cannot be sure about that. What is curious about it is the way its shell has been eaten away by something. Look carefully and you will see that it has a passenger in the form of a Lake Limpet (Ancylus lacustris). 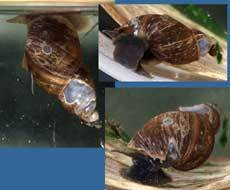 These are numerous in the pond and feed on vegetation - I'd be surprised if it was to blame for the damage. 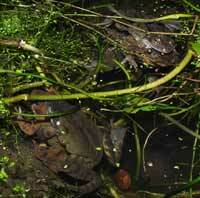 Tonight's look at the pond revealed 34 frogs - the gathering is getting under way. The picture shows the the year's first huddle, a relatively small one with 5 or six (I think) involved. I saw a three newts tonight - this one remained stationary all the time I was by the pond. It is 'perch among fronds of Hornwort (Ceratophyllum demersum). 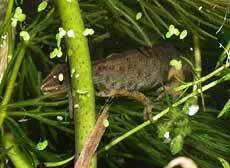 If you look closely you can see a small, light grey flatworm just about to pass over the newt's head. There are no pairs in sight, and most of them are, like this one, looking out towards land as though waiting for the perfect mate to arrive! Earlier today I spent some time cutting back the Irises at the end of the pond favoured for spawning last year. As a result the water is a bit cloudy tonight. 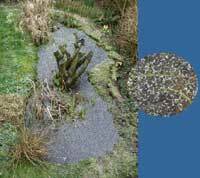 I used a grapefruit knife to cut through the rhyzomes - the curved point made it less likely that I would damage the pond liner! 14 February - With temperatures remaining quite mild (nearly 8C at 8am this morning) the frog numbers are increasing. Last night I could see 53 in the two ponds. 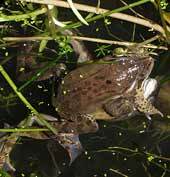 However, they were very quiet, with only the occasional croak heard, and there was little enthusiasm for chasing possible partners. The couple of pairings I saw were short-lived affairs. 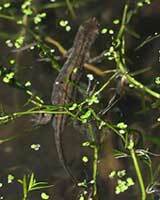 I saw at least four newts on patrol amongst the underwater plants. This afternoon we watched one pair of frogs getting very animated, rolling about with such energy that twice they rolled out of the water and up onto the bank. Other frogs showed a little bit of interest in the proceedings but it was short-lived and that part of the pond was soon quiet again. 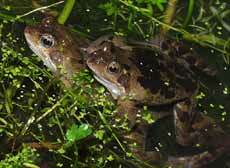 By 9pm the temperature had dropped a few degrees, to below 6C and visible frog numbers had dropped to 39. 16 February - It remains quiet as daytime temperatures become slightly colder. 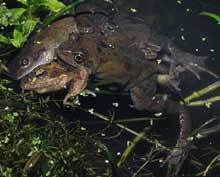 Tonight's check of the ponds revealed 29 frogs at the surface, with only these two paired up - I heard no frogs calling in the time I was by the pond. 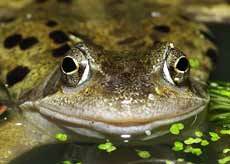 18 February - With the daytime air temperature remaining below 10C the frogs have remained quiet, with only 25 seen tonight, and no croaking. 23 February - The pause in the proceedings continues as the daytime temperature stays low. Last night the ponds almost completely froze over with a thin layer of ice. By this afternoon only a few fingers of ice remained and I heard the croaking of a solitary frog. The water temperature was only between 2-3C at lunchtime and clear skies this evening suggest that it may well freeze over again tonight. 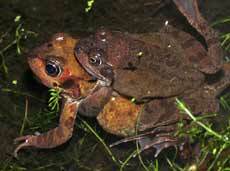 Having given up on the frogs for today, I went down the garden to lock my shed at 9pm and heard croaking and a splash. Despite the fact that ice was already forming, these frogs were rolling over and over in the middle of the pond. The only other frogs I could see were sitting on the bottom. 24 February - As expected there was a cover of ice over both ponds this morning, although it disappeared quickly in the morning. Despite slightly higher air temperatures (up to 7C) I saw no frogs at the pond surface during the day. Tonight at 9.45pm there was much more activity. I counted at least 54, but there were more that dived as I moved closer. I could see one 'clump' of frogs that was under the surface but there weren't any pairs on the surface. With the cloud cover breaking up the water temperature was just over 4C while the air just above the pond was at 3.5C. 25 February - Just a little bit of ice this morning, but as happened yesterday there were no frogs insight during the day. Tonight I checked the pond at around 8pm and I can still see only one frog actually at the surface (top right in this picture). 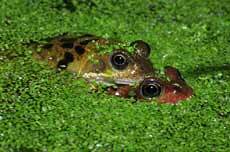 The rest of the frogs in the image are submerged and keeping very still. I haven't seen any of the newts these last few nights. The water temperature at 8pm was 3.8C while the air just above the pond was already -0.3C under clearing skies, so I would expect ice to form again tonight. 27 February - The last two nights have been cold enough to cause the ponds to freeze over completely, with lows of 3.1C and 2.9C being reached in the early mornings. Daytime temperatures of 4 & 4.5C meant that much of the ice melted during the day. First thing this morning we had a fine sprinkling of snow which only settled on the ice of the ponds, although even that disappeared quickly once the sun was high enough. This afternoon I topped up the big pond - the windy, and largely dry weather means that water loss seems to be greater that I usually expect at this time of year. 28 February - Last night was not as cold and this morning there was an area of open water in the big pond, which was being used by the birds. Tonight, at 8pm the air temperature was again down to 0C above the pond and there is ice forming at the 'shallow end'. The water temperature is 2.7C and I can only see two frogs at the surface. It was on this date that the first spawn appeared last year. 29 February - Today, with the help of periods of sunshine the water temperature has crept up to 3.4C (at 5pm), just half a degree warmer than the air just above the pond. There is still some ice on the surface. 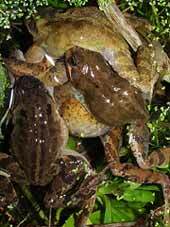 The only frogs to be seen on the surface are these three, two males in a tight embrace around a female (bottom left). You can hear the occasional croaking from one of the males but all movement is taking place in very slow motion. There are at least five other frogs gathered on the bottom just below the group. A hard frost is forecast for tonight, so I expect the pond to be frozen over again.